One of the most exciting reasons to collect NFL rookie cards is that you get to watch their values spike if the player performs well on the field. To help capture that excitement, Upper Deck launched a new website to help collectors track 2009 NFL rookie cards, and make predictions on which rookie would have the best week at OwnTheRookies.com. Collectors who successfully guess the player who will be Upper Deck’s “Rookie of the Week” will be entered into a drawing to win a box of 2009 NFL trading cards. For having the best single game performance of any of the 2009 rookie running backs so far, New York’s Shonn Greene is the top rookie of Week 7. If you entered codes from Greene’s cards last week, stay tuned to the website to see if you are a winner! While playing at the University of Iowa, Shonn Greene was definitely a player many fans expected would become successful in the NFL. He was the first Iowa player to win the Doak Walker award, was named as an All American, and had the talent to be a great professional back. As the rounds moved on in the 2009 draft, Greene was passed up by just about every team in favor of more polished backs like Knowshon Moreno and Donald Brown. The New York Jets weren’t buying it, and traded up to select him in the third round to play behind aging Thomas Jones and Leon Washington. During camp and the preseason, it became clear that Greene’s first few years would most likely be in a backup role: this was the case until last week. Leon Washington, who had been having a good year playing with other Jets rookie Mark Sanchez, went down with an injury at the beginning of the game. Greene was called upon to fill his shoes, and did so with reckless abandon. He rushed for close to 150 yards and two scores on the way to a convincing Jets victory over the struggling Raiders. Greene looked great, and I’m sure a few of those teams who passed on him in the early rounds were smacking themselves. Greene isn’t the first later round pick to shine this year, but he is the first running back to explode on the field. His performance outshone any other rookie running back so far, and did so by a wide margin. Not only did he wreck the Raiders’ defense, but he did it off the bench. Truly impressive. Now with Washington out for the year, Greene has all of a sudden put himself at the top of the Jets running game. This has led to a huge spike in his value, and luckily for collectors, there are few things on the horizon to help them out in getting a hold of his cards. The first are his cards out of UD Black, featuring the first hard signed high end offering of the year. Greene will surely be featured prominently as a participant in the 2009 Rookie Premiere, and that will mean lots of rare and valuable cards. Secondly, Ultimate Collection and SP Authentic are not far off anymore, and both look to be some of the coolest cards of the year. In addition to what is coming, Greene has some great cards that have already hit the market. First, his SPX Rookie Jersey Auto looks great. It has pieces of player worn jersey as well as a great example of an autograph signed by a player who cares about the way it looks. 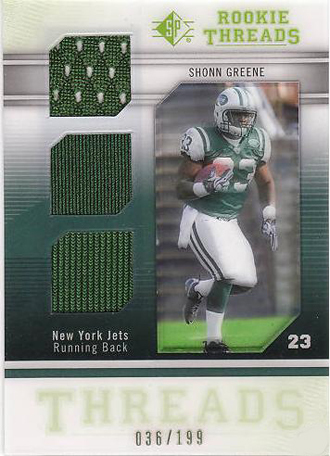 Greene was also part of the recent SP Threads release, and his acetate embedded rookie jersey card was unique to say the least. The card has swatches of player worn jersey just like the SPX, but the player picture is printed on a stock that is translucent. This gives a great effect when looking at it, almost like the player is a ghost on the card. Lastly, Shonn’s Upper Deck rookie card has one of the better action shots of the set. I always love to see a great photo for the card subject, and this one does not disappoint. It is one of those cards that I could see as a great one to get signed, or to keep for the future. Greene definitely has the prospects to make it worth your while to pick up a few right now. Next week will be a bigger test for Greene as he faces a team that’s a little more competition than the Raiders. Miami has a good defense, and Sanchez may need to rely on the rushing game a little more than usual. Jets fans are hoping Greene will continue his torrid pace and give the team more added hope in their 2009 rookies. I Jets collectors are banking on it, literally. Check in next week for the newest rookie to win “Rookie of the Week” honors and don’t forget to enter in all your rookie card codes from the Upper Deck products you have collected so far. Not only can you win prizes, but the site has some great features that allow you to track rookies and their cards this season! Greene isn’t quite at the top of the Jets running game yet–Thomas Jones is still their main back. He rushed for 121 yards and a TD on 26 carries against the Raiders as well–after putting up 210 against Buffalo the week before. No doubt, Greene will get carries–but I would expect it to be in the 10-15 rushes a game, as Washington was getting, unless they have another rushing performance like Buffalo (where Jones & Washington combined for over 300 yards–Greene had one carry for zero yards).